A quick one today cause my little bubby is not feeling well and just wants cuddles. I'll quickly post this while she sleeps. When I posted about my favourite purples, I said this was at the top of the list. OPI DS Original. 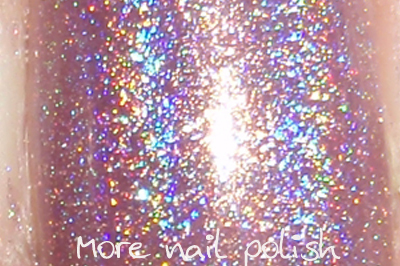 This was the first holographic polish I ever purchased and it holds a special place in my heart, I love it. 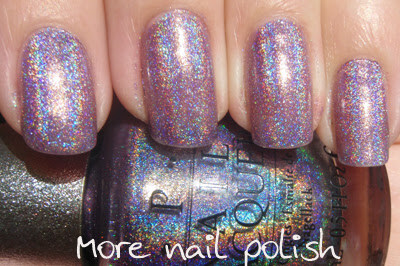 This is one of my 'go to' polishes, which goes on like a dream, dries super fast and looks fabulous with anything you wear. It always makes me feel happy when I wear it. Do you have a HAPPY polish? WOW! That is an amazing color! I wish I would have purchased it when it was a reasonable price!! I don't really have any go-to polishes at the moment- just whatever I look at and feel like. In the winter time, it was Sally Hansen's Celeb City. Purrrdy! ...I hope your cutie feels better ASAP! JQ - thanks for your lovely comments. My littlie is only 4 months, so I get plenty of cuddles. But my boy is three, and doesn't stop, so I know exactly what you mean. Stickers - I'll have to check ebay to see what its selling for. Thanks for the award. Definitely Addicted - I love Celeb City too, that silver is such a bling! And thanks for your wishes for little bubba. rock-or-not - I wish I had more of these DS polishes too!! They are HTF and $$ now! oooh love it, want it! The DS polishes are always oh so gorgeous!